Argentine bond investors are still waiting to get paid — and they’re starting to get restless. After all, if this summer’s technical default didn’t end the stalemate between Argentina and its holdout hedge fund creditors, what will? The question remains uncertain (and investors hate uncertainty obviously) so bondholders of all stripes — those who took haircuts on Argentine sovereign debt dating back to the country’s 2001 default, and those who did not — are working on more creative ways to recover their money. 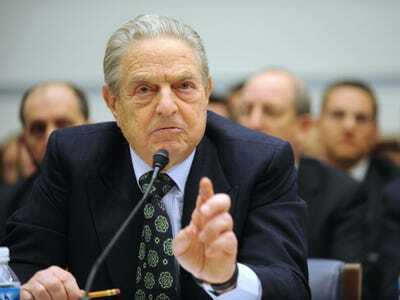 In the latest twist of all the many twists, legendary investor George Soros and Hayman Capital’s Kyle Bass have both filed suit with a UK Judge, asking that he release $US282 million worth of interest payments on their investment in the country, according to Bloomberg’s Kit Chellel. Argentina’s custodial bank, Bank of New York Mellon, wants the UK payments to be put on hold until disputes here in the US are resolved. Soros and Bass are suing BNY Mellon too. That payment has been held up by the fact that a US Court ruled that bondholders who did restructure their debt — like Bass and Soros cannot be paid until bondholders who did not restructure — holdouts, like hedge fund manager Paul Singer — are also paid. That ruling is what tipped Argentina into default on July 30th. When Buenos Aires tried to make a payment to exchange bondholders and not the holdouts, that payment was stopped by a US Court. Since then, the country has made attempts to change the jurisdiction of the bonds from New York City to Buenos Aires, and has tried to change the custodial bank in charge of payment distribution too. So far, though, investors have not gotten paid. Now Soros, Bass and a few others are arguing that they are “innocent third parties” in this whole debacle, and shouldn’t be punished for Argentina’s holdout spat. Meanwhile, they also argue, what’s an English Court doing upholding a US Court order anyway? Argentina’s President Cristina Fernandez de Kirchner met with George Soros in New York City in September. They discussed Argentina’s energy sector. It’s got a lot of promise due to the country’s large quantities of natural gas, but its development requires investment. And that investment isn’t coming in full until this whole debt issue is cleared up. Another powerful players has also come into the game — a new holdout with more at stake than Paul Singer. Billionaire Kenneth Darth owns $US595 million worth of defaulted Argentine bonds to Singer’s $US503 million. Last week Dart asked a New York Judge to give his claim the same treatment as Paul Singer’s. In addition to Dart, there are approximately $US2.4 billion worth of bonds out there that are governed by New York law and in the hands of other holdout investors. The minute Argentina settles with Singer’s group and the bondholder payments are allowed to flow through, all the other holdouts will likely rush forward to Judge Thomas Griesa’s court, demanding the same legal rulings and the same terms, which could block the payments again. That would mean that even after Argentina paid the Paul Singer and his company (The Gang of Five, as they’re called) the country would still be in default until it paid out the other holdouts. This is what happens when you put things off.